Level Up Boost- Soon we will have new levels. Take this opportunity to get all conqueror levels. 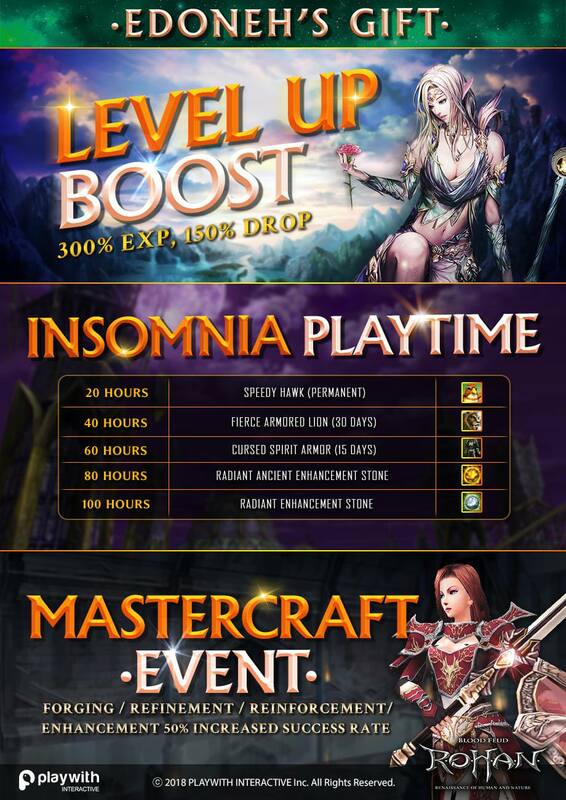 Insomnia Playtime - Are you ready for another Play time event? !This time, we want you to show your loyalty to R.O.H.A.N. world! This Playtime will be available from May 30th until June 06th at midday. - You will receive the rewards if you have at least one level 40 character on the account. - The hours do not have to be consecutive, we add up all the hours that you have played during the period of the event. - The reward will be delivered per account at the Mall Inventory. - The rewards are cumulative and will be sent at the end of the event. - The hours are counted per account (You can play with any character and accumulate hours). - The hours accumulated are based by server and account. - We recommend to accumulate hours on the main server where you play. Challenge yourself and do not miss this unique chance to take advantage of this incredible blessing. As I have tested and seen these boosts aren't exactly what them seem to be! A friend wasted around 70 ARS VI and Abradants trying to +12 Absolute Set, how much investment this requires? Also currently running Insomnia Playtime, the rewards illustrated above aren't exactly what them should be. Seriously Speedy Hawk (Permanent)? why it would not be useful some monkeys? or even 15 day Hunter Kit? Hence the only benefit that brings this Edoneh’s Gift is Level Up Boost which really feels good. Im the one who made 70 attempts to reinforce absolute errings. what the hell? Thre is no event. They mock us, they must be laughing as hell in their office watch us trying to reinforce/forge while they count their dollars. Playwith Interactive, i will soon lose my patience with your bull****. Soon enough we, the ones who provide you salery, will move to another game. Dont piss in the plate that feeds you. Use forge buffs and farm those tickets! Never between 2012 through 2014 did I ever manage to make 2 Unique weapons and dlvl/stat refine them with just 1, 1!!!!! !, failure to combine. 30 levels refined down in under 3 minutes. No preserves wasted. Whatever this event is, I'm happy. Are the recycle rates for Walter's and Talismans also improved in this event?